I didn’t plan on doing this week’s Zakka Style project but I’m glad that I did because I’m quite happy with how it turned out and will actually use it! 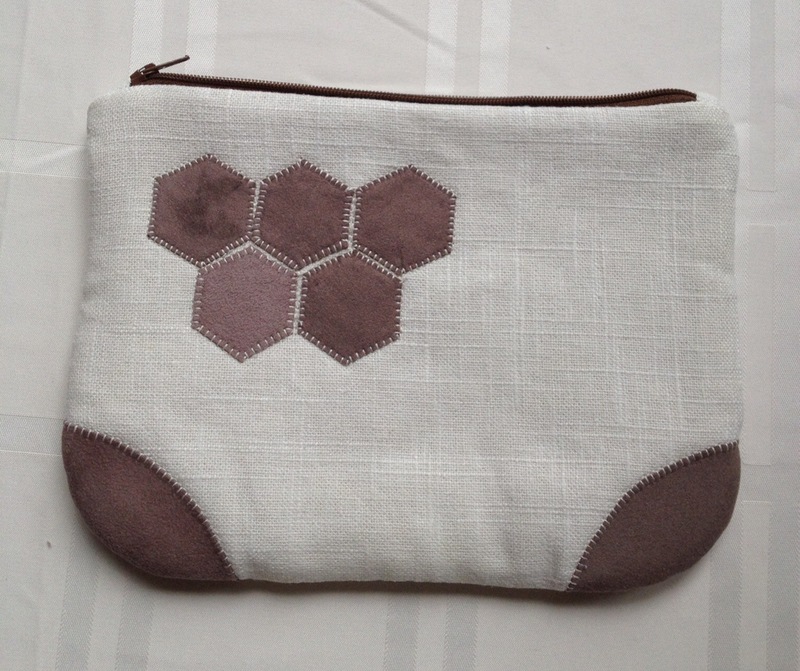 There is a BIG incentive to complete this project and to link it up to the sew along – a nice collection of Cosmo Thread by Lecien. I was intrigued by the post by The Patchsmith who said she has threads all over the place from making this. After thinking about it for awhile and reading the directions again, I thought that starting with a large patchwork piece and cutting it into strips on the BIAS might be an answer to the loose threads. So I tried it! 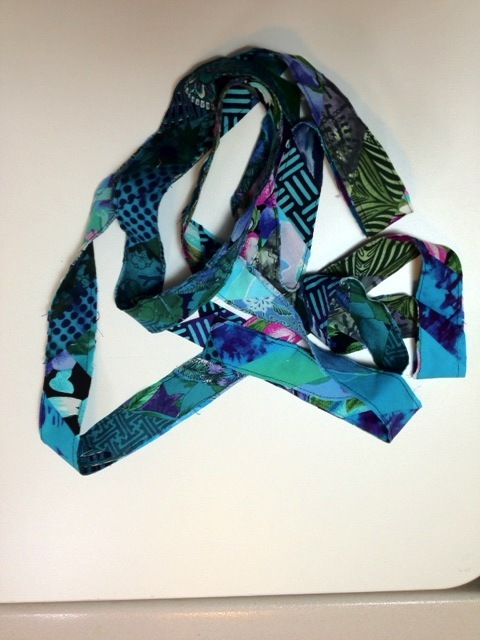 I sewed some strips together, cut them into smaller pieces and then sewed the pieces together in an arrangement that I thought would give me a long run of bias. I cut bias strips 1 1/4 inch wide from this. No frays on the edges and the front of the stripes looked great. The back, though, had all those seams. I joined the strips together using a bias join technique. I thought about stopping here and using the “ribbon” this way. However, there was so much of it that I decided to go ahead and sew it all together with the wrong sides together using a simple running stitch down each edge. After that, I had only half of the length but no raw edges showing at all! 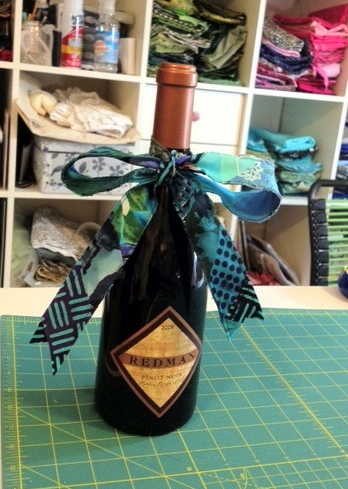 After looking around for something to be the gift to tie it onto for the photo, a wine bottle seemed perfect. 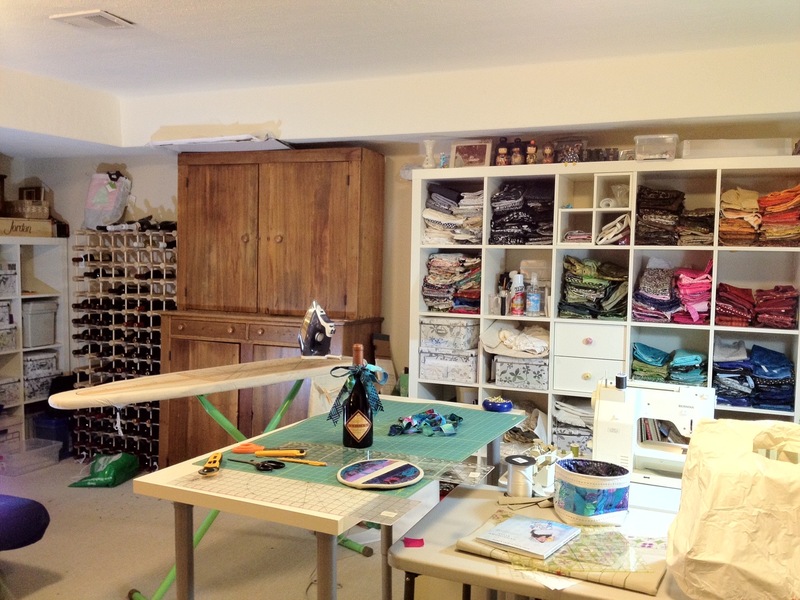 My sewing space is incredibly well “stocked”! Don’t you agree? Fabric to the right. Wine to the left. This week’s project from the Zakka Style sew along is an Elephant bookmark. It was designed by Kat Mew. 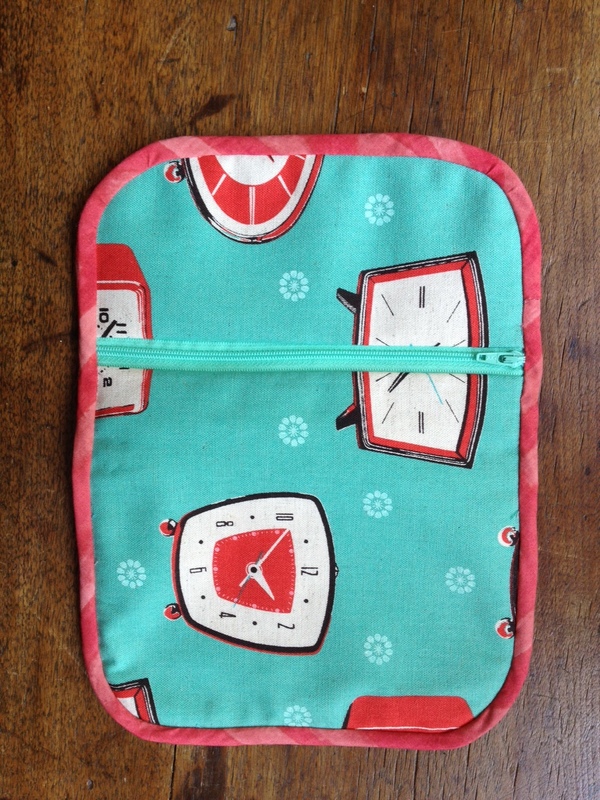 The guest blogger for the sew along is Angela from Cut to Pieces. 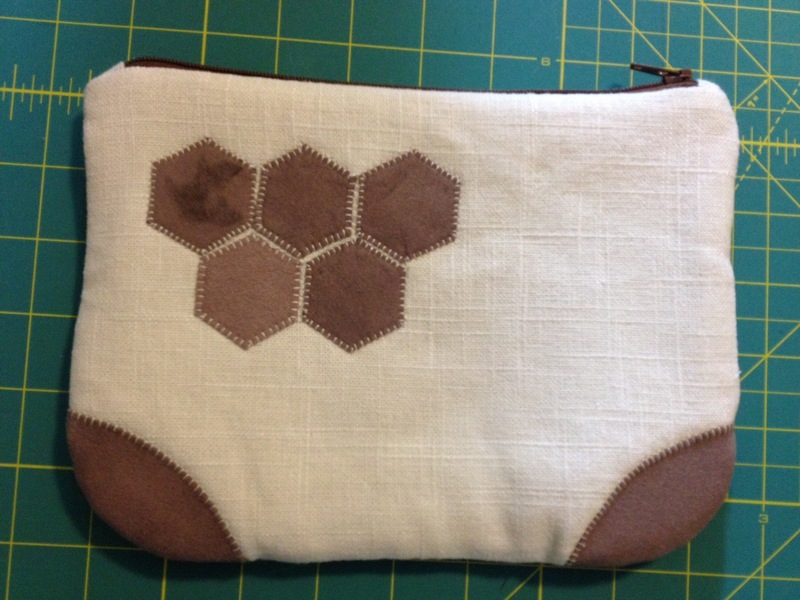 I used a fabric strip set that was already sewn together. It is hard to tell this in the picture because the batik fabrics are so similar. 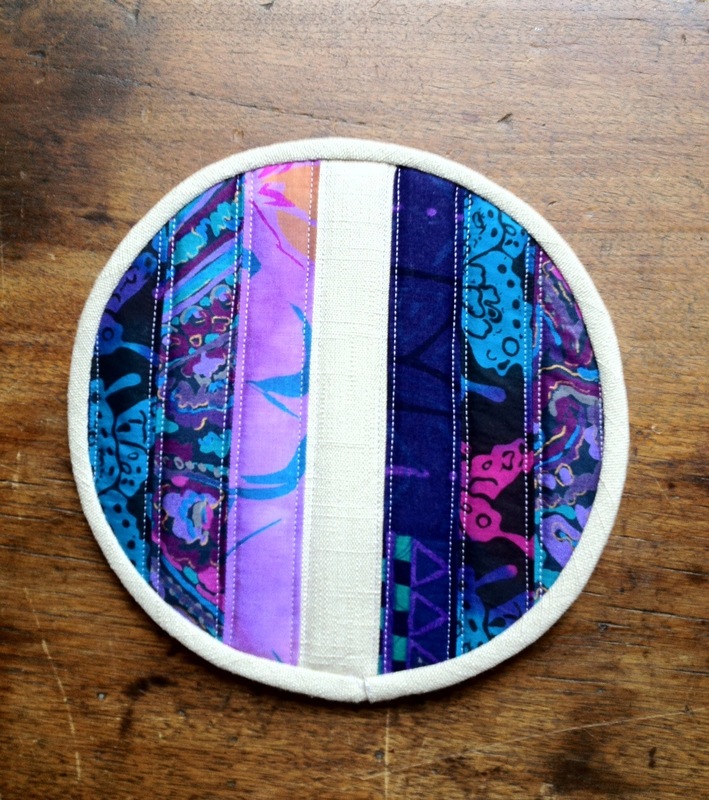 I put the strip set right side to another piece of batik fabric, put the pattern on top, and sewed around it. I did not use any interfacing. There were so many comments from others who made this about how hard it was to turn, I just decided not to interface it. Here is a picture of the back side right before turning. I trimmed very closely and clipped all the inside curves. Trimmed with my beautiful Gingher scissors! 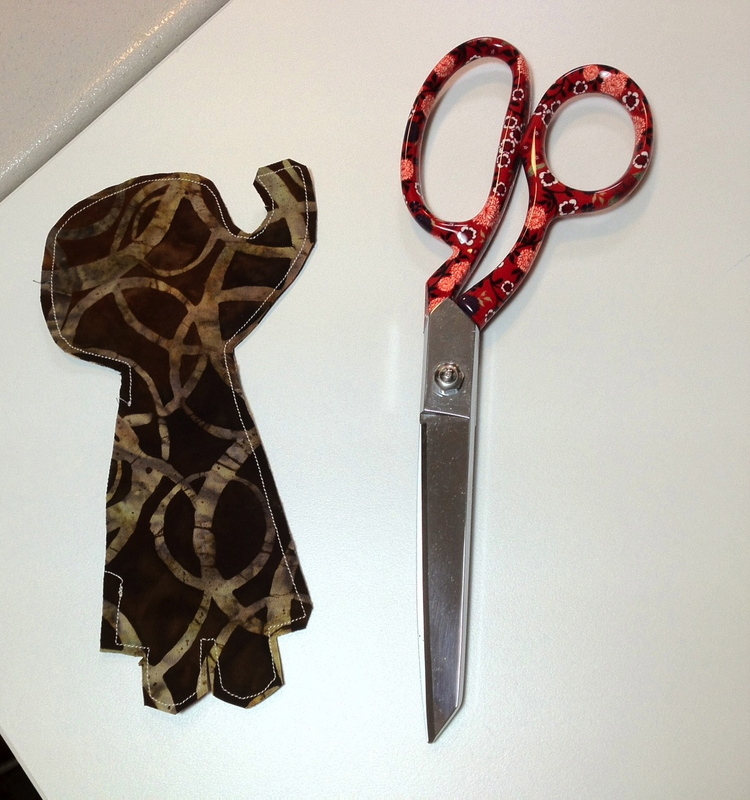 These scissors were a Christmas gift from my daughter, Lindsey. I love them! There is nothing in the word that cuts as smoothly as these. I didn’t have any trouble turning my elephant right side out but it was pretty flimsy without the interfacing so I did the next best thing – I spray starched the heck out of it – several times! This was actually quite effective and it is now pretty stiff. I then sewed an ultra suede ear on. I didn’t bother with an eye because somehow there is a star on the fabric right where the eye would be. I couldn’t have fussy cut it any more perfectly. Marking it’s place in my Zakka Style book. Linking to LR Stitched Zakka sew along. I started this project yesterday when I was waiting for an air conditioning service guy to arrive. 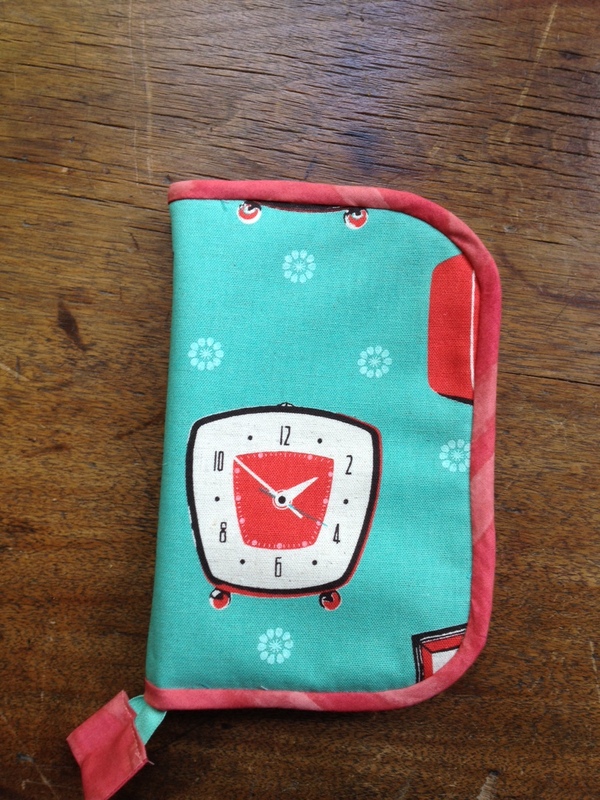 I finished it today when a friend came over to sew with me. My daughter looked at it this evening and asked how long the friend was here (all day) and was surprised this is all that I had made during that time. I guess she doesn’t understand how long it takes us to chit chat and show each other what we’ve made since the last time we visited one another! And we had to have coffee…and lunch! We’re probably lucky we got anything done. My air conditioner is now working but my internet is out. I’m posting on my husband’s computer who has a special” thingy” to hook it to the web without an internet connection. This computer is unfamiliar to me and doing weird things like centering my writing and I can’t get it to align left so I give up! Goodbye until I can use my own computer! Good luck to everyone who is making this organizer this week. 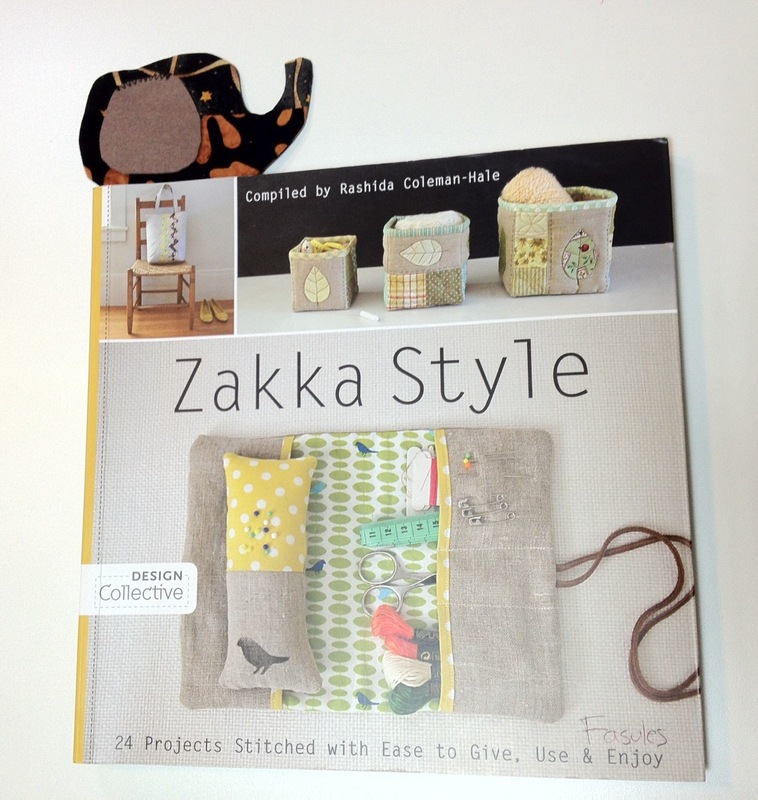 Have you been sewing along with the projects from the book Zakka Style? It’s been fun to see all of the different versions of the projects starting from the beginning of the book. The first project was a tote bag and it took some time to make up. However, since then, the projects have been very quick and relatively simple. The idea with the Zakka Sew Along is to read the guest blogger’s notes for that week’s project on Monday and make the item up and link it by the following Sunday. I’m going to be traveling some over the next few weeks so I thought I had better look ahead. There is only one quilt in the book and it is coming up in a few weeks. I have a charm pack of Japanese woven fabrics that I’ve been saving for just the right project, and I think this is it! My squares are 4″ and the pattern in the book calls for 6″ but that does not deter me. I will just add more rows/columns to make the quilt the same size. I made a sketch to help determine materials and sizes needed. I’m considering sewing this together with my serger. I have never sewn a quilt together this way before but all of these fabric are rather loosely woven (especially this linen) and I think it might be a good idea. I did not get last weeks project (mini magnets) done due to travel for my husband’s birthday. However, I still feel like I’m ahead instead of behind because I’ve got this quilt all cut and ready to sew. This was a fun and easy project. Thankfully, many of you have already posted about it so I was forewarned about following the directions exactly. The best suggestion that I have to add is that the directions want you to “turn” the project through a 1 1/2 inch opening. I thought it was easier to leave the whole 3 inch end open to turn through (see pictures below). There were not many pictures or diagrams for this project so I tried to take pictures of each step. I hope this helps! Pieces all cut and patchwork sewn together. Sew the small linen piece to the top of the patchwork strip and the longer linen piece to the bottom of it. Baste the closing band 1" from the top of the small linen piece. 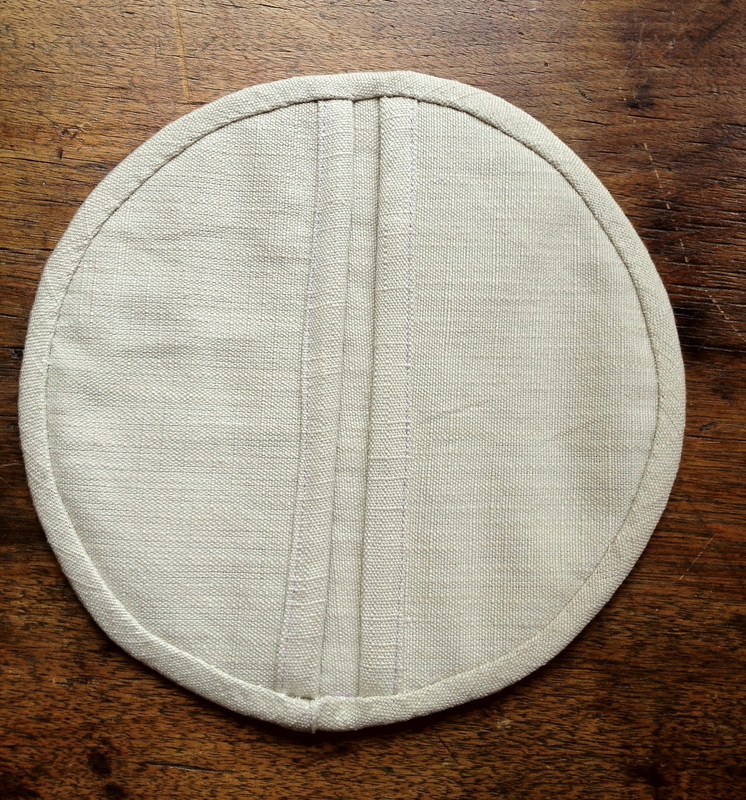 After fusing interfacing onto the wrong side of the lining piece, sew lining to linen piece across top with right sides together. Fold lining back at top and topstitch along the fold. 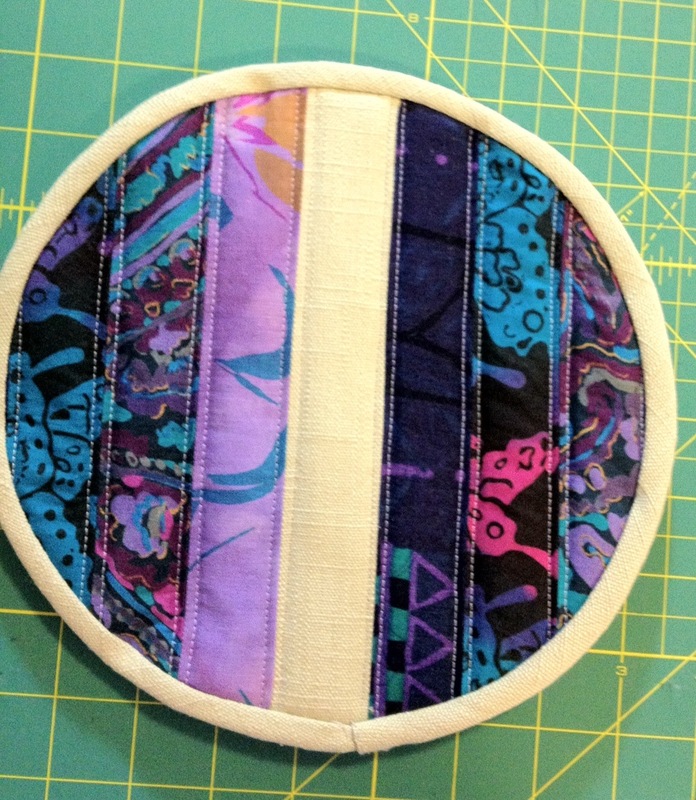 With lining side up, fold the lining right sides together by folding 5 1/2" from the topstitched edge. Turn the piece over and fold the linen exterior in the same way - aligning raw and folded edges. Sew along raw edges on both long sides. I left the 3rd raw edge open to give more room for turning right side out. Folded edge is not sewn. Topstitch opening closed and it's done! 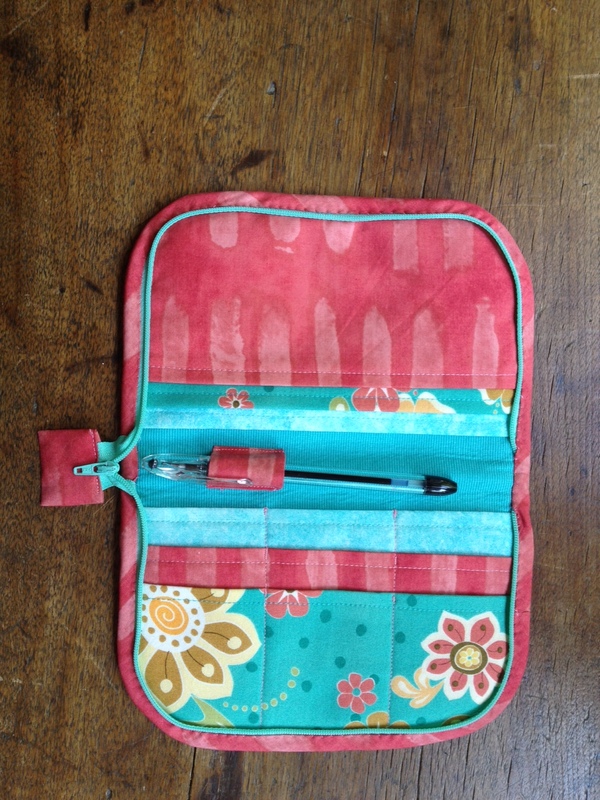 It has been suggested that it could be used for a small pair of eye glasses or to keep crochet hooks in. I might use mine to keep my small rotary cutter in when I take it to a class.